Washing dishes is typically not anyone's favorite chore to do. Having a dependable dishwasher takes some of the drudgery out of after-meal cleanup and provides time for more pleasurable activities. Although there are factors to consider regarding when to replace it, a well-maintained dishwasher should last several years. A homeowner unloads a dishwasher. Compared to other household appliances, dishwashers have a relatively short life span of 10 to 13 years on average, according to the HouseLogic website of the National Association of Realtors. Gas ranges, for example, have an average life expectancy of 11 to 15 years and refrigerators, 14 to 17 years. Rather than wait for their dishwasher to break down due to age, some homeowners buy newer models that provide energy savings, have new features or look better with their kitchen's design. The life span of a kitchen appliance depends to a large extent on the amount of use it gets. 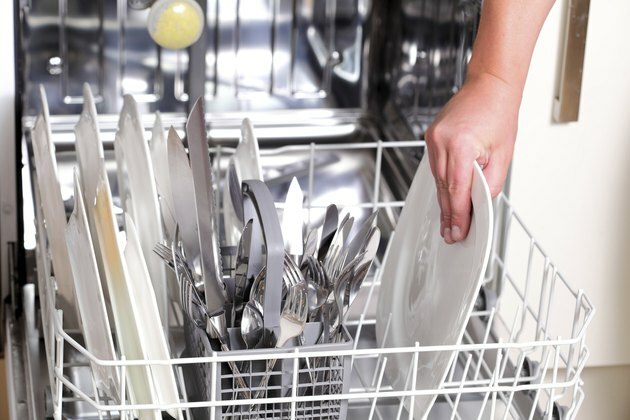 People who want to keep their dishwasher for as long as possible can increase its life span with a few simple practices. According to Lowe's, those include loading the machine properly; running at least one cycle each day; loosening hard food particles; cleaning the inside properly, including the arms that carry water; and flushing out the sink's garbage disposal. What Causes a Dishwasher to Stop Mid-Cycle?